1) Add your patient’s picture to their main chart. 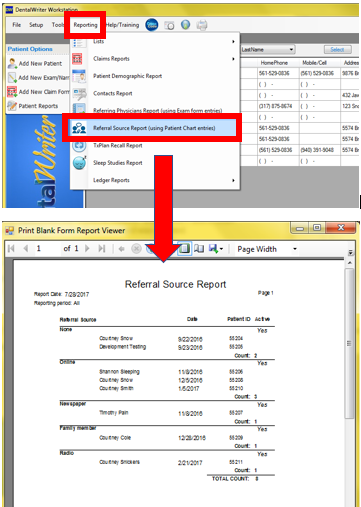 3) Run referral source report. 4) Print appointment history inside of the appointment book. 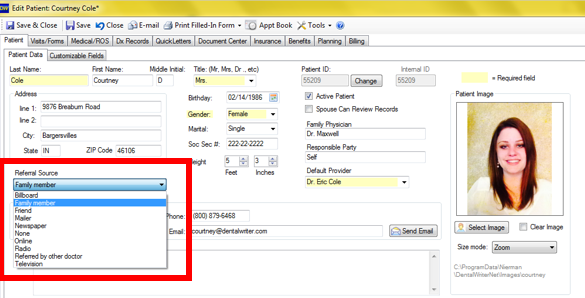 5) Fax number shown in main contacts list view. 6) Updated Medicare Advance Beneficiary Notice (ABN) forms added to QuickLetters. 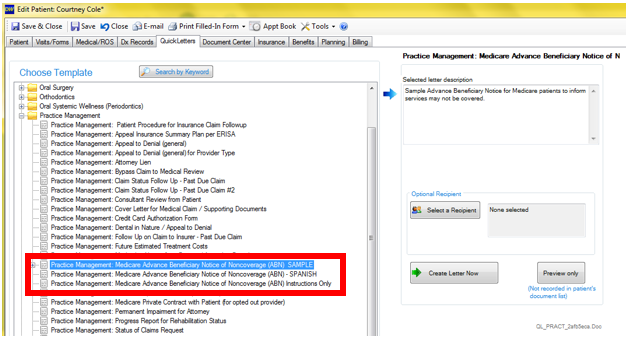 7) Plan, summary & notes now viewable for Oral Surgery/Implant on visits/forms tab in patient chart. 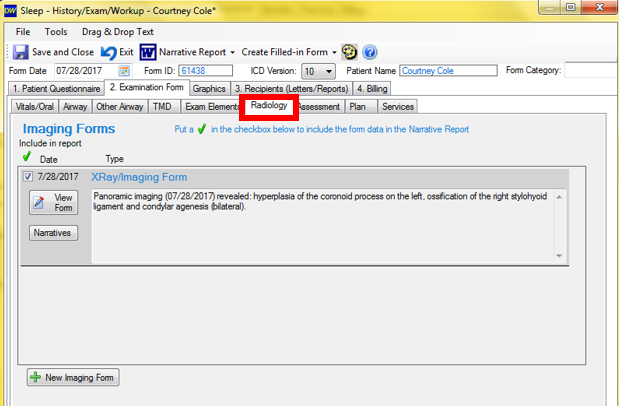 8) Imaging forms now available in sleep visits under “radiology” tab. You asked, we listened! Below are 15 highlights included in the upcoming update. If a feature enhancement your office has requested is not included with this update, not to worry! We work diligently year round to constantly update DentalWriter and include features to make the user experience better and better. 1) See how many times the online forms downloader has checked for new submissions when in “auto check” mode. This allows you to see how many times the downloader has checked for new patient questionnaires when you set your online forms downloader to “auto check” at any time increment you set. 2) Preview your quickletter templates. This allows you to preview a quickletter template generated in Microsoft word, without it automatically saving to your patient’s document center as a generated quickletter. 3) New detailed print out for treatment plans. The detailed print out for treatment plans includes each procedure code, their descriptions, and a completed checkbox. You can still print out a summary as well. 4) Fresh look for questionnaire and exams. The background color for all questionnaires and exams has been changed to white with blue labeling. You can choose custom background colors for each page if desired, with new “web colors” available. 5) Use searchable ICD list inside your medical claims. The ICD codes list inside claim forms has been changed from a dropdown to a search window for easy searching and selecting of ICD codes. 6) Preferred contact number added to appointment book. 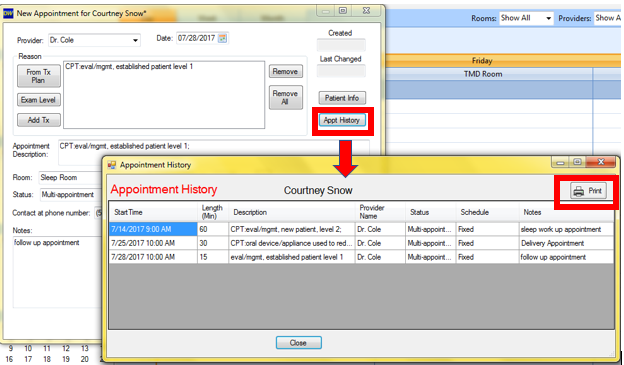 Select from the main chart numbers or enter a different number into the appointment for preferred contact method in the appointment book. An arrow will indicate the preferred contact number on appointment blocks when viewing the schedule. 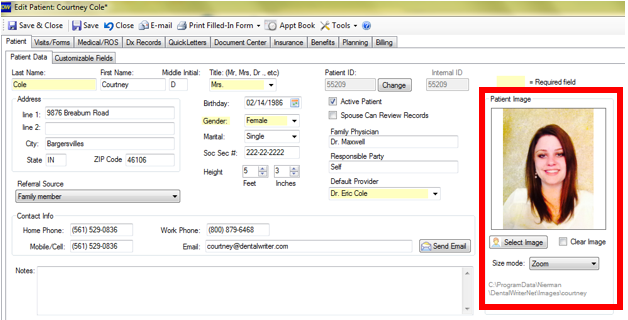 7) The DentalWriter database upgraded to SQL 2014. For increased security & to ensure the product continues to be supported by Microsoft. 8) Ability to print out patient appointment history & upcoming appointments. Provide your patient with a list of upcoming appointments to keep them on track. 9) New sleep quickletter templates added. Great new quickletters for your sleep practice – an OSA fact sheet as well as announcements to patients & physicians to spread awareness that your practice offers treatment for OSA. 10) Send a copy of your online patient questionnaire links to your registered e-mail address from your online forms download manager. Your online patient questionnaire links allow your patients to complete their intake information online, which seriously cuts down on administrative time spent on data entry of medical history and treatment specific questionnaires (not to mention saving paper, ink, and headaches for your team). 11) Ability to print a claim statement from inside claim forms. You can print out both a claim statement as well as a payment authorization statement from right inside your claim forms. You can disable the reminder prompt when generating claim forms that reminds you to complete box 10 if the services are related to an accident. This is located in the setup menu in configuration options, on the application tab. 13) Updated header for visit summary report. The header for the visit summary report (found on the visits/forms tab in any patient chart) will appear on top of each page if the report is longer than one page, and will include patient name, address, date of birth, patient ID, and report date. 14) Change your password inside DentalWriter. Change your password and/or recover your log in right inside of DentalWriter desktop from the setup menu instead of going to the DentalWriter website. If you are using the ledger in DentalWriter, create mass statements for all patients with an open balance in your ledger and run ledger A/R aging reports.